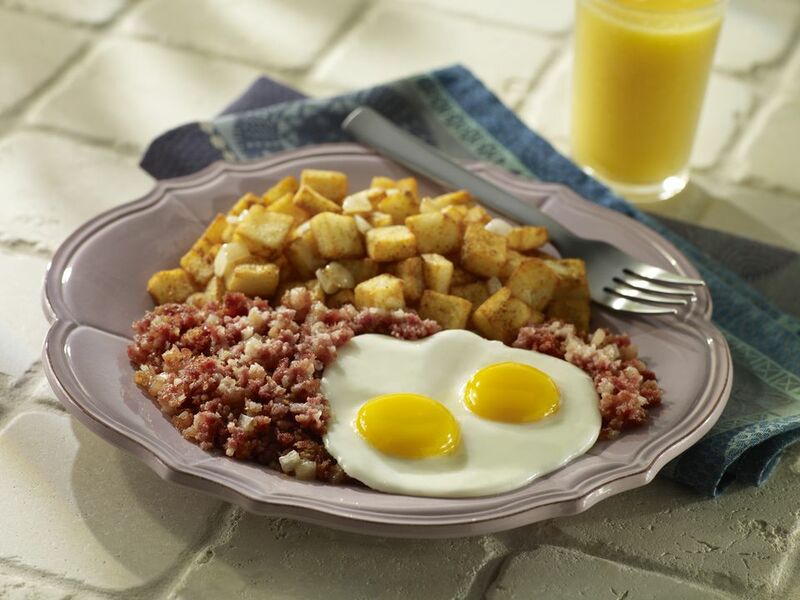 Corned beef hash with eggs is a country breakfast favorite is hearty enough for a dinner meal. In a large bowl, combine potatoes, corned beef, onions, bell pepper, milk, flour, and parsley. In a large skillet, preferably with nonstick coating, heat oil over moderate heat. Add the hash mixture and, using a spatula, pack it down firmly to form a solid cake. Reduce the heat to low. Continue cooking the hash, shaking the skillet occasionally to prevent it from sticking, until the underside is crusty and well browned, about 10 more minutes. Using the back of a spoon, make four indentations in the hash. One at a time, break eggs into a saucer and slip them into the indentations. Increase the heat to moderate, cover the skillet and cook until the eggs are just set, about 6 minutes. Cut the hash into wedges, garnish with chopped parsley, if desired and serve immediately.